Product #18682 | SKU MG1018 | 0.0 (no ratings yet) Thanks for your rating! Take a large camera system and make it compatible with the Kessler Kwik Release System with this 6" long Kwik Long Camera Plate . 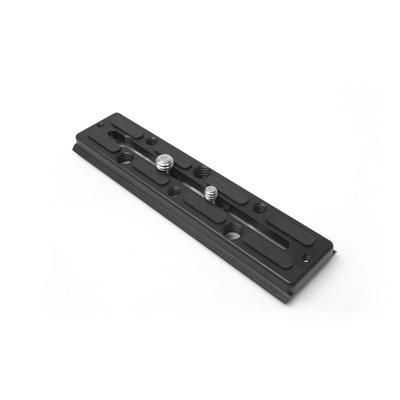 This Arca-type compact plate offers two 3/8"-16 screws for secure mounting on select systems. It also features multiple 1/4"-20 and 3/8"-16 threads that allow users to mount additional items, such as microphones and monitors. The base has two safety screws to prevent the plate from accidentally sliding completely off the receiver and a hex key is included.